Ένα ντοκιμαντέρ κληρονομιά για τον παγκόσμιο πολιτισμό έχει ετοιμάσει το National Geographic για τιμήσει τα 5.000 ελληνικού πολιτισμού. Το ντοκιμαντέρ θα προβληθεί στο κανάλι του ομώνυμου σταθμού σε μία σειρά από επεισόδια τα οποία θα μας ταξιδέψουν στην αρχαία Ελλάδα. Το ντοκιμαντέρ αυτό θα προβληθεί από την 1η Ιουνίου μέχρι τις 10 Οκτωβρίου 2016 για να δει όλος ο πλανήτης ποια ήταν η πολιτιστική προσφορά της χώρας μας στην σημερινή κοινωνία. Το ντοκιμαντέρ αυτό έχει τον τίτλο The Greeks και πραγματικά αποτελεί μεγάλη τιμή γην Ελλάδα καθώς γίνετε και σε μία περίοδο που θα μπορούσε να βοηθήσει και να προβάλει την χώρα μας σε όλο τον κόσμο. Agamemnon to Alexander the Great: A stunning exhibition celebrating 5,000 years of Greek culture. Now Open. The museum will close early at 2:00 p.m. on Thursday, June 2. The exhibition spans over 5,000 years of Greek history and culture and takes visitors on an exceptional and fascinating journey back to the origins of the cradle of Western civilization, its heritage and the traces it has left in the hearts and minds of the Greek people. The exhibition begins its North American odyssey in the country’s leading archaeology museum before continuing to the Canadian Museum of History in Gatineau, The Field Museum in Chicago and the National Geographic Museum in Washington. It brings together more than 500 priceless artifacts from 21 Greek museums, co-ordinated by the Hellenic Ministry of Culture and Sports. For Pointe-à-Callière, this achievement is another in the series of great international exhibitions it has produced over the years, including Archaeology and the Bible – From King David to the Dead Sea Scrolls and Japan, introducing Montrealers and visitors to some of humanity’s most impressive treasures. Greek Antiquity is a rich and spell-binding period, a time populated by mythical heroes and historical figures, under the watchful gaze of the gods on Mount Olympus. The exhibition is divided into six zones that introduce us to this great civilization and showcase rare and priceless artifacts. Visitors will meet many famous characters in Greek history, from Homer to Aristotle, Plato, King Philip II of Macedon and King Leonidas of Sparta. The heritage of ancient Greece, which we can still see all around us today in our politics, philosophy, arts and literature, mathematics, architecture, medicine and sports, is clearly illustrated in the exhibition. Visitors are invited on a tour of Greek history, starting in the 6th millennium BCE, explaining all these roots. We learned about the exploits and adventures of the heroic and legendary figures in the Trojan War through Homer’s epic poem the Iliad. Led by Agamemnon, the Greeks sailed a thousand ships all the way to Troy, where the Trojan Prince Paris was holding Helen captive. After laying siege to the city for ten years, the Greeks left an unexpected gift outside the gates: a giant wooden horse, filled with Greek soldiers. The unsuspecting Trojans brought the horse inside the city walls, leading to the fall of their city. In the 19th century, German archaeologist Heinrich Schliemann, convinced that the accounts in the ancient Iliad were historically accurate, found “Royal Tombs” at Mycenae containing the remains of ancient elites and their fabulous grave goods. Schliemann was in no doubt that these remains were in fact those of Agamemnon’s. The exhibition showcases objects from the tombs of the Grave Circle A, including two magnificent golden burial masks originally attributed to Agamemnon. One of them, the original golden mask, has in fact never been shown outside Greece before. 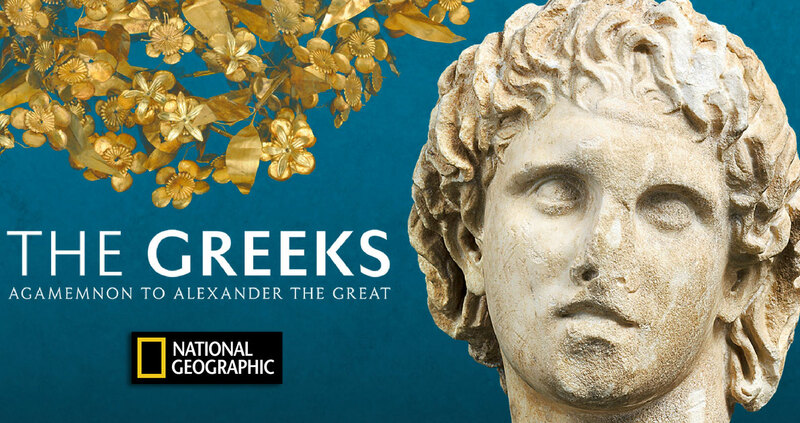 The exhibition takes us all the way up to the days of Alexander the Great, a larger-than-life figure who was only 20 years old when his father, Philip II, was assassinated. But Alexander was ready to succeed him, thanks to his education, his training and the formidable Macedonian army. Within barely a single generation, the ancient world was transformed from a series of independent city-states into a unified empire under Alexander the Great. The young prince who became king, emperor then god in the eyes of the world, died of a malignant fever at the age of 32. But his legend survived, as did Greece’s extraordinary legacy to the Western world. Between these two crucial figures, the exhibition focuses on the Golden Age of ancient Greece, in the 5th and 4th centuries BCE, when philosophy, theatre and the visual arts flourished, particularly in Athens. This was also the birthplace, under Pericles, of Greece’s greatest gift to humanity: democracy, government by the people. For the first time, citizens could express themselves, debate issues and vote. The exhibition also looks at the founding of the Olympic Games in 776 BCE, when athletes converged in Olympia from all Greek city states to take part in the Games. Among the highlights of the exhibition are a number of items never before displayed outside Greece: gold offerings from the royal tombs of Mycenae, including the mask that Schliemann first associated with Agamemnon, as well as a double-eagle necklace worn by one of the deceased, dated to the 16th century BCE. Elsewhere in the exhibition, visitors will be able to admire a marble figurine from the island of Amorgos in Cyclades, dating to the 3rd millennium BCE and a superb ritual vase from Minoan Crete. There will also be bronze helmets with gold funerary masks from the graves of the Bottiaean rulers, not to mention a magnificent funerary vase illustrating the scene of Achilles avenging the death of his friend Patroclus, from the island of Delos and dating to the late 6th century BCE. They will also see sculptures of Homer and other famous historic figures, and a superb votive relief to Asklepios, showing the god of medicine leaning on his staff, around which a snake is coiled, accompanied by his children as he receives the tributes of mortals whom he has cured. Lastly, there is a magnificent gold wreath of Queen Meda featuring two incredibly lifelike branches of myrtle, an aromatic plant, symbol of immortality, associated with goddess Aphrodite. The exhibition offers visitors a whole range of interactives and items to handle. They can touch different reproductions including a Cycladic female figurine, a block of marble, a warrior’s helmet and a sword. There are over twenty videos in the various exhibition zones, most of them produced by the National Geographic Society, the Acropolis Museum in Athens, the Museum of Cycladic Art in Athens and the Canadian Museum of History. Many activities have been organized in conjunction with the exhibition. A free digital application designed by the New Media Laboratory of the Stavros Niarchos Foundation Centre for Greek Studies at Simon Fraser University in British Columbia will keep visitors informed before, during and after their tour of the exhibition. There is also a prestigious publication on the Greek collection, produced by the Hellenic Ministry of Culture and Sports; a catalogue has also been produced by the Canadian Museum of History, surveying the themes and the key items in the exhibition. A number of major lectures will be given, at both Pointe-à-Callière and the Université de Montréal in early 2015, looking at major figures in Ancient Greece and archaeology issues. Tours and visitor activities, the Port Symphonies, Greek Independence Day, Greek cuisine on the menu at the Museum’s restaurant and films are just some of the events and attractions surrounding the exhibition. The Museum is featuring a number of activities and products relating to the exhibition: more information. During its presentation from December 12, 2014 to April 26, 2015, 132 156 people visited this exhibition. The Greeks – Agamemnon to Alexander the Great iis an exhibition produced by the Hellenic Ministry of Culture, Education and religious Affairs (Athens, Greece), Pointe-à-Callière, Montréal Archaeology and History Complex (Montréal, Canada), the Canadian Museum of History (Gatineau, Canada), The Field Museum (Chicago, USA), and the National Geographic Museum (Washington, DC, USA), with the support of the Government of Canada. The Embassy of Greece in Canada and the Embassy of Canada to Greece are working together to promote the exhibition.